Affordable housing rises along the Tram's path. That's right. 455 Main Street, Apartment 10M, is on the market, according to Zillow, for a cool $2,000,000. It's got two bedrooms and two baths but most important in driving the price into the stratosphere, "its own unimaginable 2000 SQF private terrace, in one of the most desirable buildings on Roosevelt Island!" For people who've lived here long enough to have a strong sense of Roosevelt Island's legacy, there's plenty to unpack there. A community built on subsidies enabling affordable housing will find 10M an odd fit. But it's the story of New York in recent decades, and a thriving community that makes room for all income levels must expect... well, all income levels. You could quibble about whether it's "one of the most desirable buildings on Roosevelt Island." That's a matter of personal values, and it's probably more true for the quasi-independent village in development in Southtown, one that's often seen as disengaged from the historic Island. More interesting, though, is the odd lot that sprung up, tucked into a mere eight foot frontage on East 60th Street. Backed up against the north wall of the health club where, as Tram riders, we've watched people burn calories on exercise bikes for as long as I can remember, the building went up in a way that raised more questions than obvious answers. It couldn't be an apartment building, could it? It is and an affordable one at that. 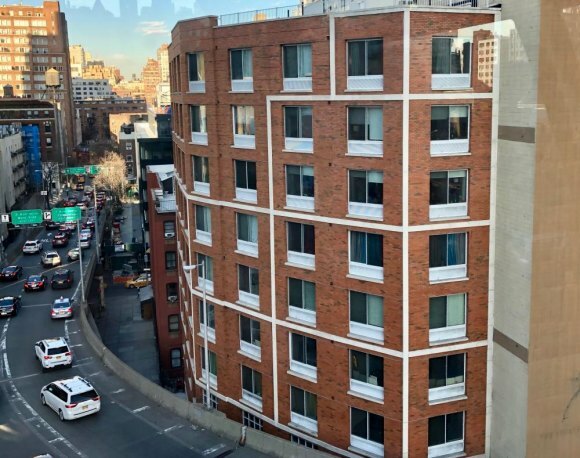 Jammed in so tightly that it's proximity to the Queensboro Bridge exit ramp and electrical cables for the Tram, builders were not allowed to use a crane for the 21 unit structure. "Instead," according to an article in the New York Times, "the developer parked a cement truck on a nearby sidewalk and poured concrete through an eight-inch hose, completing a floor every 10 days, until the eight-story, 25,000-square-foot structure was completed." The result is an incredible bargain with two-bedroom units going for a jaw-dropping $1,500 per month. And just as we marveled at the building as it went up, our new neighbors are delighted to see the Tram glide by, packed with commuters. “We’ve been posting pictures on Facebook," one told the Times. The Roosevelt Island Daily thanks Sylvan Klein for cluing us in on both stories.